It’s time for an update of how the blanket is doing. As you can see, it’s doing fine. Since my last post about it, it has been inspected by the soon-to-be-mother, and she loves it.Phew. Other than that, there isn’t a whole lot to say about it … the yarn still knits lovely, although I’m somewhat worried by the comments I’ve seen on Ravelry. 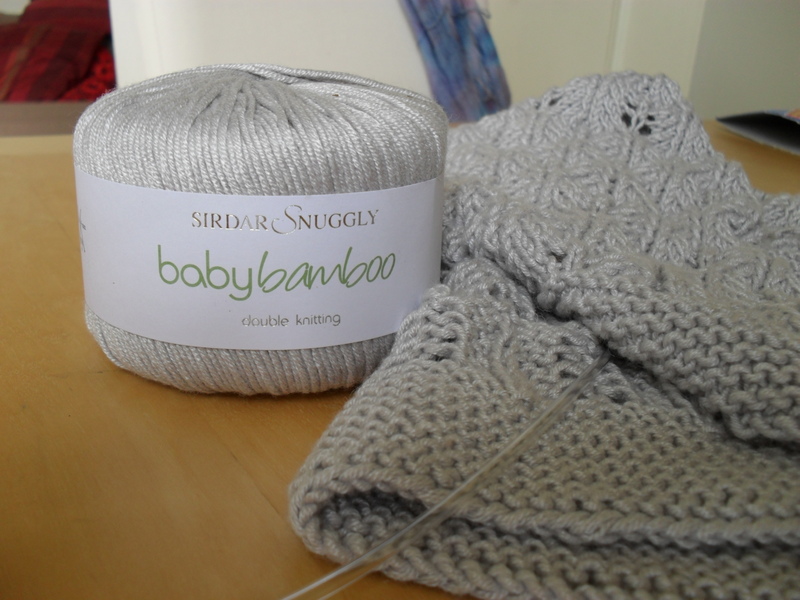 I’m using Sirdar Snuggly BabyBamboo, which is really soft to the touch and has a lovely shine to it. Reviews indicate it doesn’t wash so well, however – does anybody out there have any experience with it? At least I’d love to be able to warn my friend if it can’t go in the washing machine (which seems to be the general gist of what I’m reading). Despite those worries, the detail is coming out nicely on the blanket, and I’m now wrecking my head about an edging. 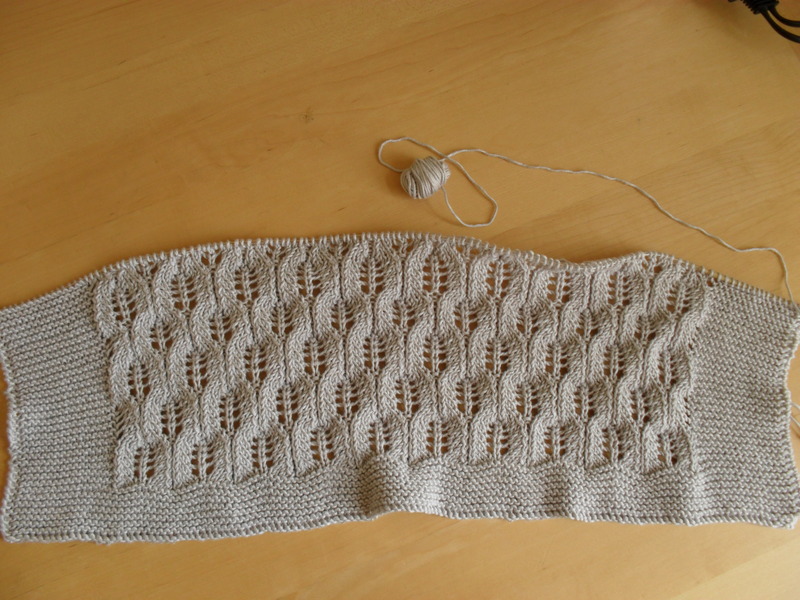 Since it has got a rather wide garter stitch, stockinette based lace seems out of the question. So it should be either an applied icord, methinks, or maybe some garter-based edging – which I’ve not seen a lot of, and I’d love to get some pointers to your favourite edgings! I’m halfway through the shawl, which means this is going much faster than I expected. Overall, I’m pretty pleased with how this turned out – if I’d start this over again, I’d make the bottom border a bit wider (I’m afraid I didn’t count properly and missed a couple of rows, cough) so that it would be about the same width as the side borders. The re-alignment of the pattern definitely pays off, methinks. I’m nearly caught up to where I was before frogging it all. Can you see how the lace panel cuts in and out of the garter border? That’s how it’s written up in the pattern, but I didn’t really like it, so I decided to “fix” the pattern. And please forgive the crappy shot, it was after midnight and I had to frog right then so I could cry myself to sleep after that and wouldn’t lose all of today fretting. At the top left you can see my chart of the pattern according to the Newspaper. Beneath that is the band from the yarn I’m using, in case I need/want to buy more at a later point – this way, I’ll always know where to find my reference sample (yes, that’s a braided sample right next to it). Underneath my new, cleaned up chart. 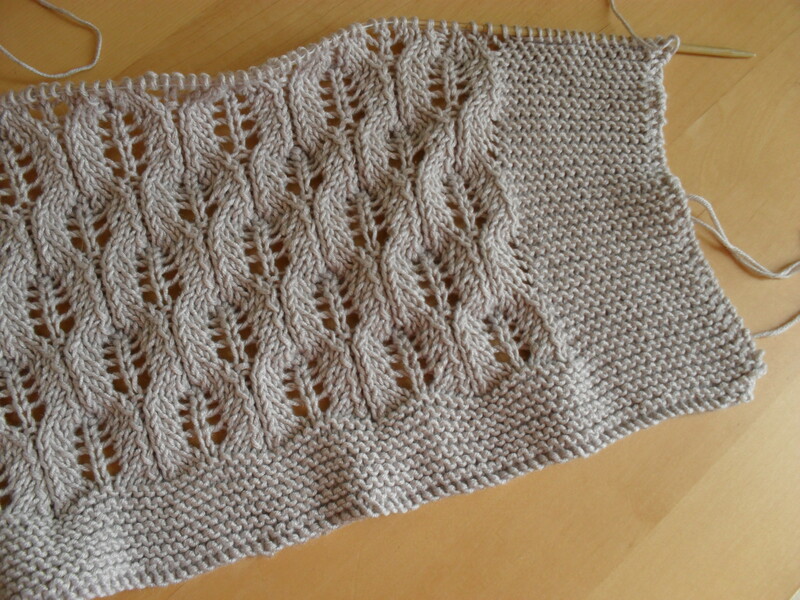 I made one further adjustment while knitting into the first lace panel, tho, and that was to take off one stitch at the end. That means what I knitted was 17 stitches garter stitch, 9 full repeats of the lace pattern, one repeat minus last stitch (which would have been the “groove” purl between the single repeats) and finally another 17 stitches in garter stitch. 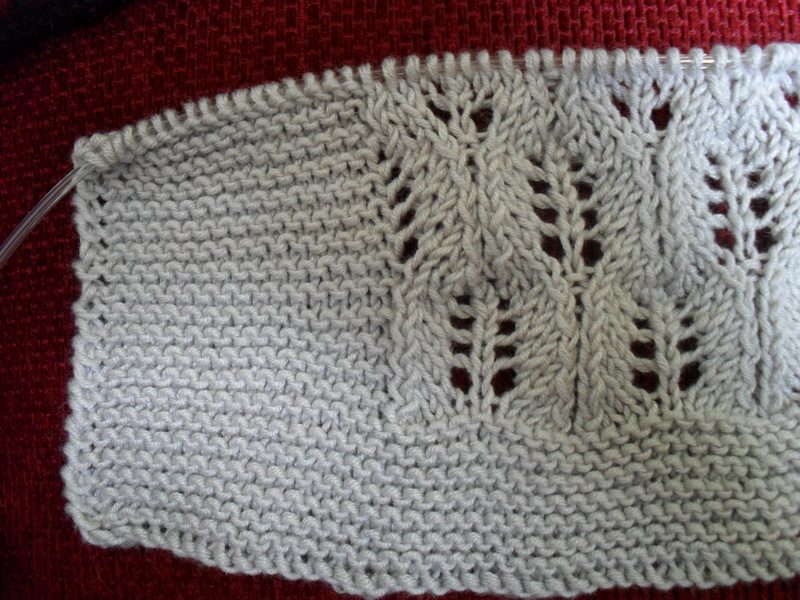 I am much, much happier with what it looks like now – oh, I also changed from “knit 2 together” on both sides of a lace panel to “ssk” on the right side and “k2tog” on the left sides. 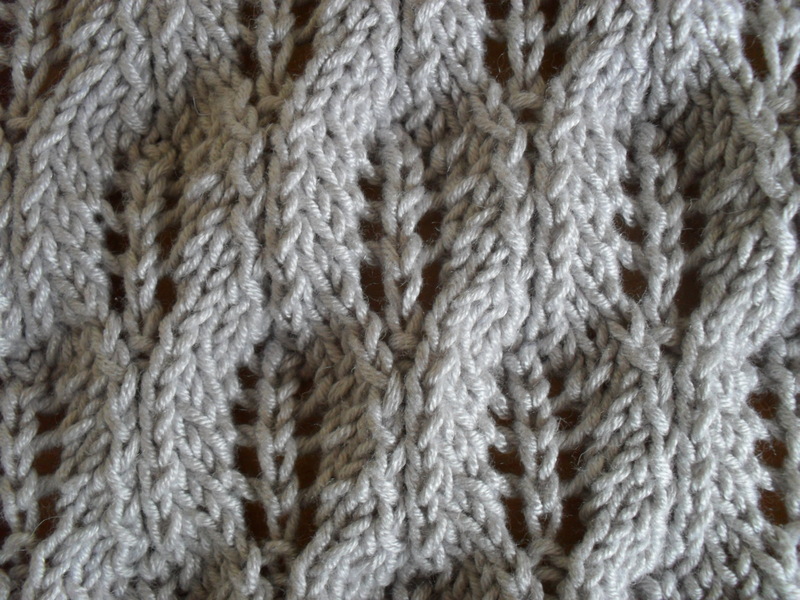 The pattern calls for you to knit the first row into the back of the stitches. I had never heard or seen this before, but will from now on do it ALL THE TIME. Yes, it makes such a big difference, I had to shout that at you. Always slip the 1st stitch purl wise. It gives a much better finish, no matter what you intend to do with it in the end. 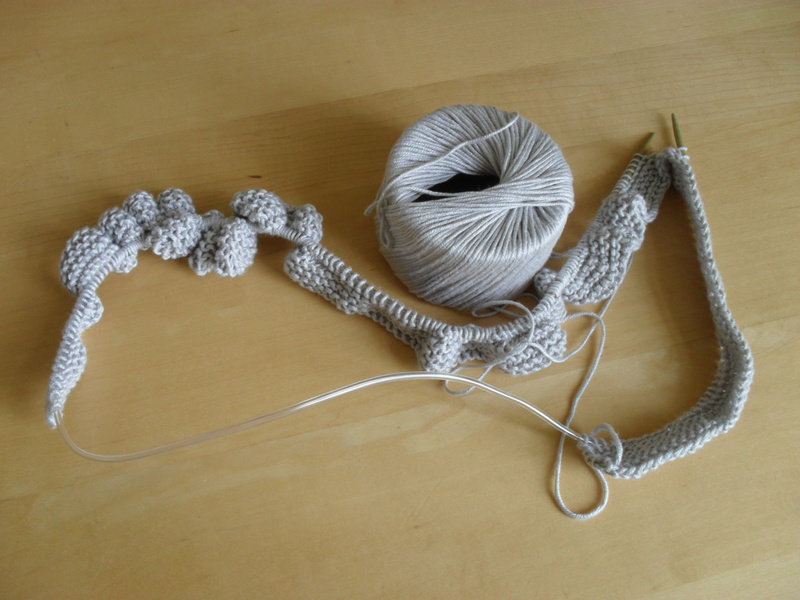 The pattern describes a crochet lace stitch to finish this off, but somehow I imagine that being a hazard for little baby fingers, and lean towards an applied i-cord. Thankfully, I have some time to decide on that one. 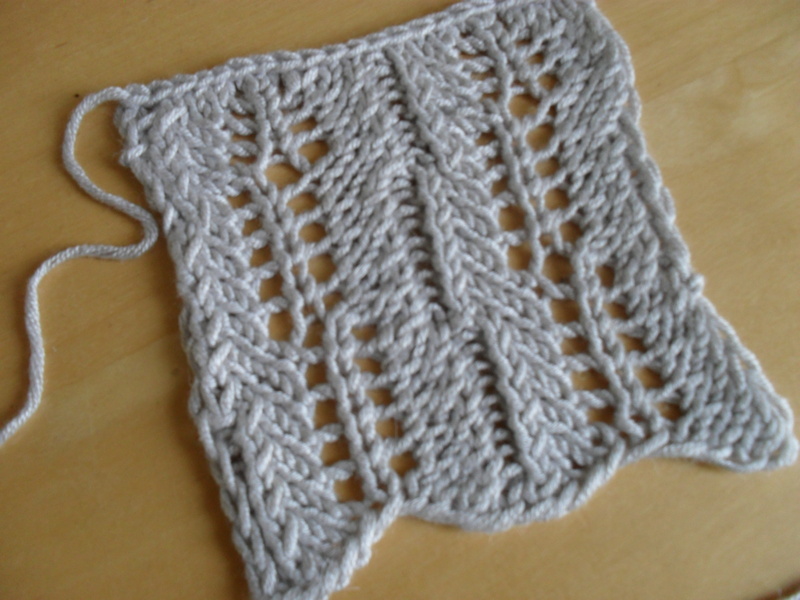 Welcome to my new blog about vintage knitting. Knitting has been part of my life every since I was a little girl, and although I took a break for a few years, recently I have been back at it. Mostly, I just start knitting and wing it from there. Sometimes, I make design drawings first. But lately, I found myself fascinated with vintage knitting. When I say that, I mean that I’ve been planning to knit something from a vintage pattern for a while – I haven’t actually done it yet. But now the opportunity I have been waiting for has finally risen, and today I cast on for my first true vintage knit. It’s a baby shawl, from the His Majesty’s Wardrobe series in The Sydney Morning Herald. This particular pattern appeared on Thursday, March 1, 1934, and it will be a gift for my friend E. who’s expecting her first baby. 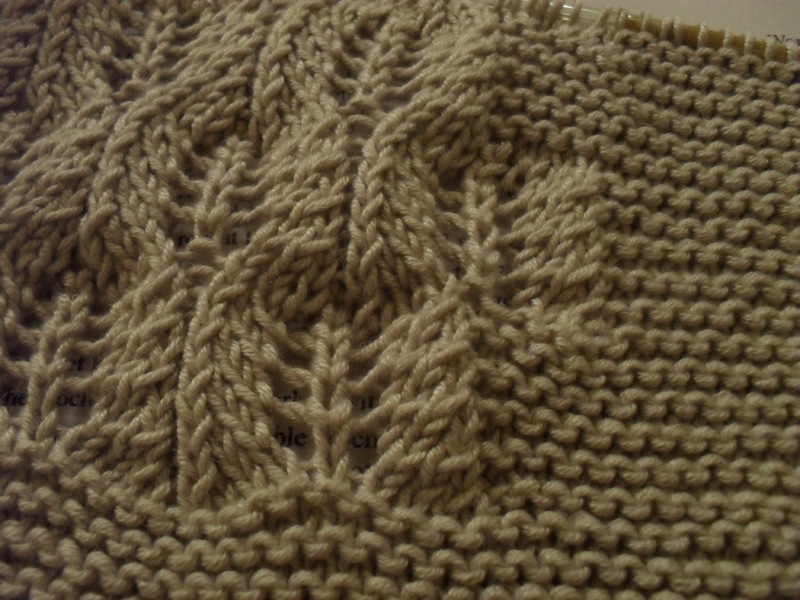 The pattern calls for wool, however, I picked a bamboo/wool mix which is very soft and a bit cool to the touch. I have heard great things about bamboo mixed yarns, but have not used any in my work yet. The yarn I am using for the shawl is very soft and feels great to touch, so I’m happy with it. It’s also machine washable at 40C, and I’m sure the young mother is going to appreciate that! 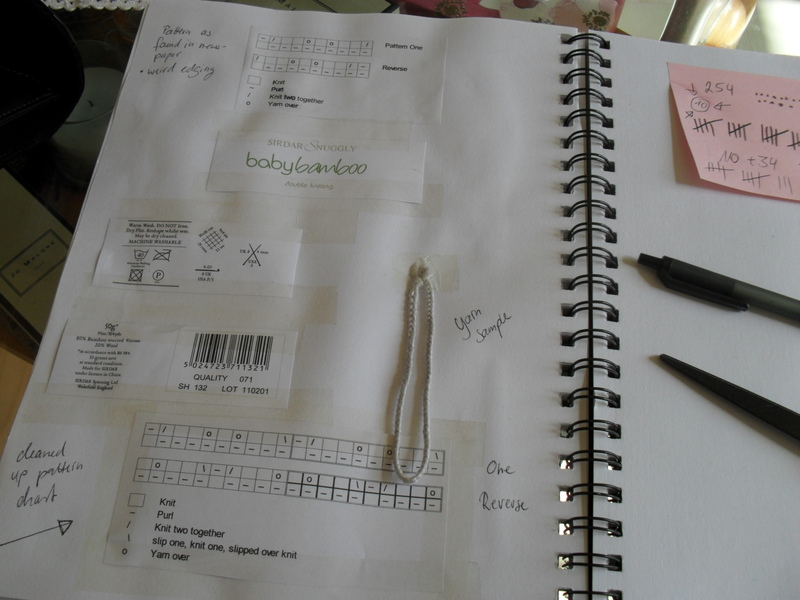 Today, I made a little swatch of the pattern, which I misaligned … this is not what the finished pattern will look like! But I love the sheen and feel of the knitted sample – I am already secretly planning a summer jumper for myself using this yarn. Then I cast on 254 stitches, and started knitting. 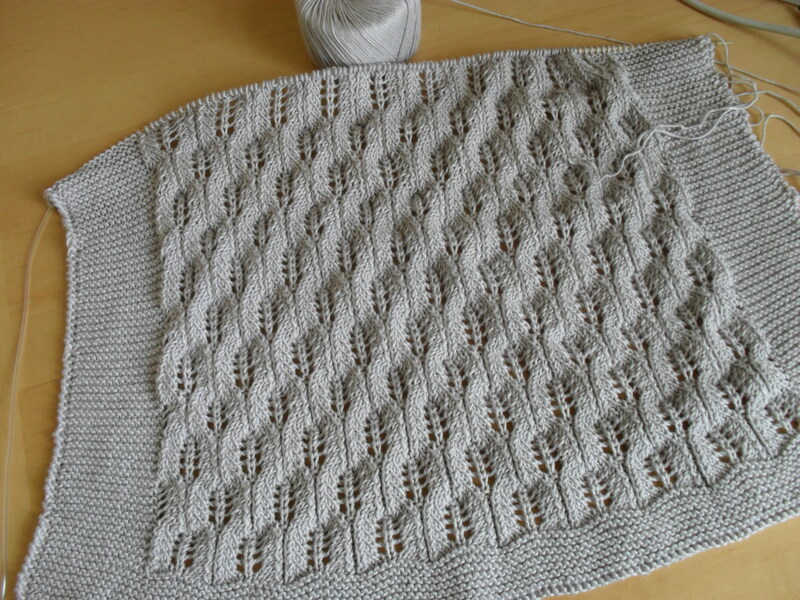 Good thing I have several months to finish this … a single row takes about 5 minutes to finish!